After the last gift is unwrapped, the Christmas cookies are eaten, and the last houseguest heads home, it’s time for the depressing task of packing up all the holiday decorations. “Sure, taking down the decorations is depressing. But it’s a lot less depressing when you open up the box next year and everything is in good condition and ready to be put up,” says Kate Mattison, the holiday décor designer for Avant Gardener, an Atlanta garden and landscape design company. Mattison should know: during November and December she and her team put up dozens of trees for both commercial and residential spaces… and come January, they’re charged with taking them all down and storing it away. Invest in large plastic tubs for seasonal storage. “But not too large,” cautions Mattison, “you don’t want them to be hard to lift.” Mattison advises labeling the exterior of the tubs with the contents or in what part of the house the decorations go. She suggests buying all the same kinds of tubs so they can stack easily, and they’ll nest while empty. To keep ribbons – especially the wired kind – fresh and uncreased, save the spools so you can roll it back up. If you’ve already discarded the spools, you could cut up paper towel rolls. And for ribbon bows, stuff wads of tissue paper in the loops so they will keep their shape while in storage. Mattison stores her ribbon in zip-top bags to protect them from moisture. For fabric items — table linens, tree skirts, stockings, and the like — launder them before putting them away for the season; you’ll have a better chance of getting stains out than if they sit in storage a year. Make sure they’re completely dry before packing them up, and store them, folded neatly, in oversized zip-top bags or in vacuum bags. 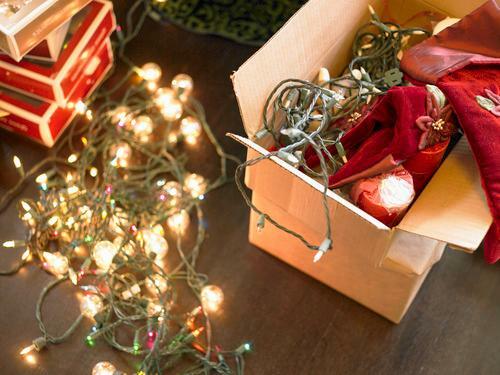 There doesn’t seem to be one foolproof way to keep strands of holiday lights from getting tangled. Mattison rolls them like a ball of yarn, ending with the plug. “This way it’s easy to plug them in next year, to check to see if the lights work,” she says. The rolled-up balls of lights also take up less space. For fragile ornaments, Mattison suggests saving the original packaging for storage. Barring that, save tissue paper and bubble wrap from holiday deliveries and gifts. Wrap each ornament in tissue paper and put a layer of bubble wrap between layers of wrapped ornaments. Store the most delicate ornaments on top so that the weight of other items in the box won’t crush them. As for the ornament hooks, Mattison says she likes to leave them attached to the ornaments, especially if they’re securely attached. It’s more convenient than trying to untangle a jumble of hooks the next year. If you have a real Christmas tree, you’ll scatter fewer needles throughout your house if you lay it on a tarp or old sheet and wrap it up before removing it from your house. Look for a localChristmas tree recycling program so your tree can be turned to mulch. For artificial trees, Mattison suggests investing in a good-quality storage bag, which will protect your tree from damage. If possible, store it upright so that the branches won’t get matted down. As you’re packing away, be sure to pack the items in the order in which you’ll need them, for easy access next year. For instance, store the tree skirt and the strand lights in a tub on top of the ornaments, since you’ll need them first. If you follow these tips, you’ll be thanking yourself next year at the beginning of the holiday season!